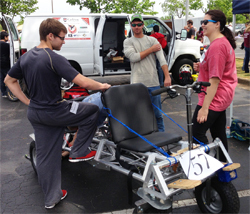 Samford University students competed against 47 other college teams in NASA’s international Great Moonbuggy Race in Huntsville, Ala., April 25-27. Samford finished 33rd in the college category. An additional 43 teams competed in the high school category. David Brown, Stevie Carnell, Taylor Friesen, Jonathan Hendricks, Austin Moore, Owen Wagoner and Philip Zeiger created Samford’s folding 200 pound entry. Carnell and Friesen piloted the buggy in the race. The annual competition at the U.S. Space & Rocket Center requires students to design buggies that can meet the unique challenges of lunar service. Weight, compactness, maneuverability over uneven terrain and obstacles push the vehicles and designers to their limits, and often beyond. Weight is no small consideration because the two-person (one female, one male) driving teams must carry their buggies 20 feet to the course starting line and quickly assemble them from their maximum storage dimensions of 4'x 4'x 4'. They must then successfully negotiate a half-mile course of simulated lunar terrain. The Samford vehicle’s design emerged from Physics Department chair Alan Hargrave’s physics seminar in fall 2012. The students completed the buggy this semester in the university’s fully-equipped Propst Hall machine shop, a highlight of the department’s tour for prospective students. “This may not be the most glamorous part of the tour, but it is the part of the tour that gets the most oohs and ahs,” Hargrave said. Samford’s buggy improved upon the university’s 2012 entry and left a pile of cannibalized bicycles that, frankly, are better off as a moonbuggy. Some of those bike bits are still recognizable on the pedal-powered, front-and-back tandem 2013 model, but a welded aluminum frame is the core of this year’s entry. Hendricks, a junior physics and engineering major from Plant City, Fla., was the team’s designated welder. He grew up on a family farm and came to Samford with lots of experience keeping farm equipment running. “This is my knack,” said Hendricks, who plans to continue to graduate school and pursue a career in mechanical engineering. He was back in Samford’s shop on Tuesday after the NASA competition, measuring the strength of dried versus fresh bamboo for his Samford Showcase project. He was still mulling over what he learned from the race, though. “The gears in my head are always running on something like that,” Hendricks said, and within moments talk turned to the prospect of a bamboo buggy for 2014.